KANSAS CITY, Mo. 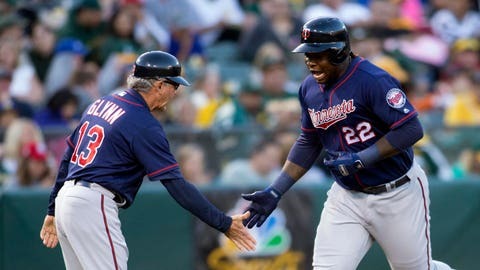 — Miguel Sano is getting back in a groove and playing in a park he loves to play. Sano went 1-for-10 in the three-game series at Seattle after missing 24 Minnesota Twins games with a left hamstring strain. Sano hit a two-run homer in the fifth inning in the Twins’ 8-5 triumph over the Kansas City Royals to open a three-game series. The two teams will meet again Tuesday night at Kauffman Stadium in the middle game of this series. Sano made his big league debut in Kansas City on July 2, 2015 and singled in his first game. He went 6-for-15 with a pair of RBIs in that series. “This is the ballpark I realized my dreams,” Sano said. “My dreams came true when I started in the major leagues and it’s good to me. Royals center fielder Jon Jay leaped at the wall, but came up just shy. Since the start of the 2017 season, Sano had 25 RBIs in 13 games against the Royals. He has a 15-game hitting streak against Kansas City with a .373 batting average and a .745 slugging percentage with six home runs and 26 RBIs. Jay has put together a 10-game hitting streak for the Royals. He had four hits, including the first three-double game of his career, in the Memorial Day defeat. Jay entered the game with only seven extra-base hits. It was his second four-hit game of the season. He is hitting .376 in May with an American League-leading 40 hits. The last Royal with more than 40 hits in May was Johnny Damon with 41 in 1999. Kyle Gibson, who was drafted out of Missouri, will start Tuesday for the Twins. The right-hander will be making his 16th career start against the Twins. Gibson is 6-4 with a 3.46 ERA against the Royals, allowing 36 earned runs in 93 2/3 innings. Gibson, who is 1-3 with a 4.02 ERA this season, did not factor in the decision in his last start against the Royals on September 7, 2017. He gave up two runs on eight hits and a walk over seven innings in that start. He beat the Royals on Sept. 2, 2017, tossing six scoreless innings on five hits, with three strikeouts and three walks. Royals backup catcher Drew Butera is 6-for-9 with a home run off Gibson, while starting catcher Salvador Perez is 6-for-35, .171 with two home runs and six RBIs. Alex Gordon has a .324 average, 12-for-37, with one homer and five RBIs versus Gibson. Mike Moustakas is 10-for-30 with one home run and one RBI off Gibson. Left-hander Danny Duffy will start for the Royals and will try to build off his last outing when he held the Texas Rangers to four hits and one run over a season-high 7 2/3 innings. Duffy, who is 2-6 with a 6.14 ERA in his 11 starts, has a 5-1 record with a 2.49 ERA in 17 outings, including 13 starts, against the Twins. He has allowed three or fewer runs in 12 of his 13 starts against Minnesota. Duffy has not beaten the Twins since Aug. 21, 2016, a 2-1 decision, although he has a 3.44 ERA in his three starts since then. Duffy is 0-2 with a 6.98 ERA at home this season.